Beer and wings seem to be a classic pairing at pubs. 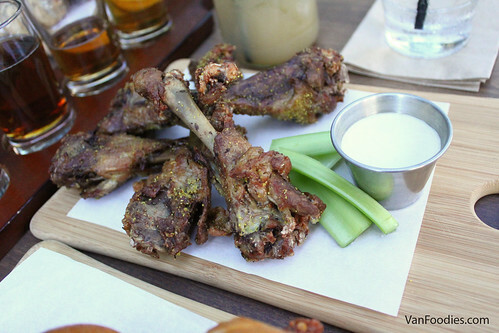 At Prohibition, they elevated it by making duck wings. Yes, duck wings. Well they didn’t serve the wingettes; instead they served the drumettes of ducks, lollipop style. The meat was tender and seasoned well, certain bites maybe borderline on the dry side. Supposedly you can choose the flavours: hot, lemon pepper, and BBQ. We were given the lemon pepper ones and you can definitely taste the zesty lemon flavour from the pepper sprinkle. The meat was more flavourful than chicken wings, and more substantial; I like this interpretation of wings. Next, the Pulled Pork Sliders were of good value. 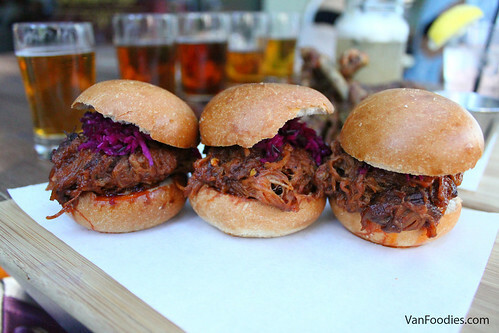 Three sliders with generous portion of saucy pulled pork. They used pickled cabbage to counter the sweetness in the BBQ sauce and I thought there could be more of it and more acidic – overall it’s still on the sweet side. This is a messy dish to eat so be prepared! 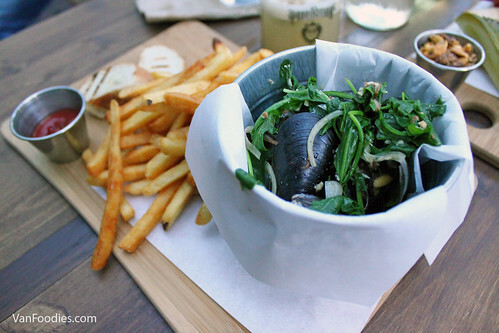 Lastly, the Mussels and Fries were more of an entree plate while it’s still shareable. The mussels are steamed with your choice of Prohibition beer. The beer served the same purpose as using white wine in the sauce, so there’s a slight hint of bitterness from the beer. The mussels were not bad, maybe a bit small in size for my liking. Fries were crispy on the outside yet still fluffy inside. 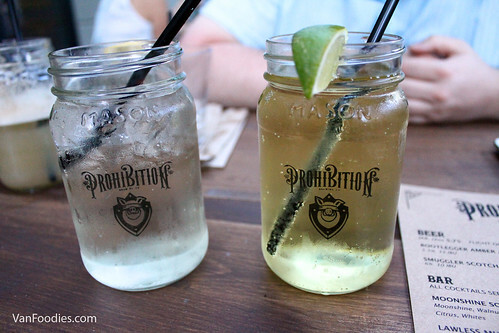 We got to sample an assortment of drink offerings available, including Prohibition’s lineup of beers, a cider, spritzer, and a cocktail. Over to Bryan. 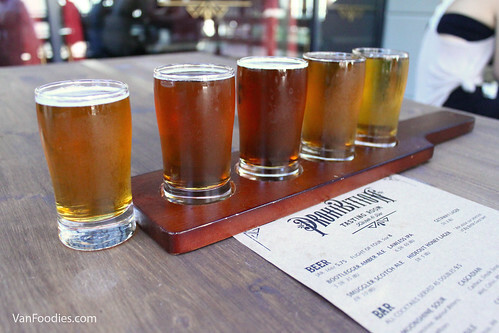 The beer flight started from right to left in the picture above. Getaway Lager – The first beer on the flight, and the least flavourful of the batch. Something for a first time or beginner craft beer drinker. Hideout Honey Lager – A definite improvement. Get this instead of the Getaway Lager, because honey makes everything better. Bootlegger Amber Ale – First thing that hit me is how sweet this was, especially compared to the honey lager. To me it seemed to have an almost syrupy caramel sweetness, without a syrupy mouthfeel. Smuggler Scotch Ale – Light on the nose. Some, but minimal hops. Caramel and roasted malts round out this scotch ale. A nice beer, best one yet. 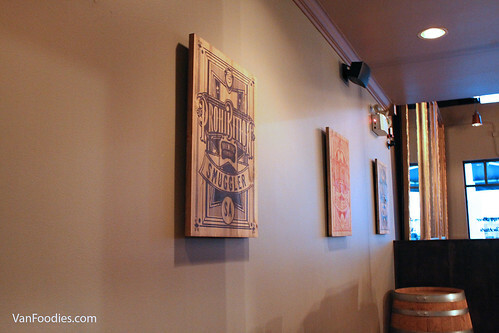 Lawless IPA – A highly competitive style in the BC craft beer scene. This brew, at 60 IBU, comes in below the heavyweights in the category, making it a bit more accessible for the entry level IPA drinker. Features mainstay IPA traits of hops, pine, and fruit. 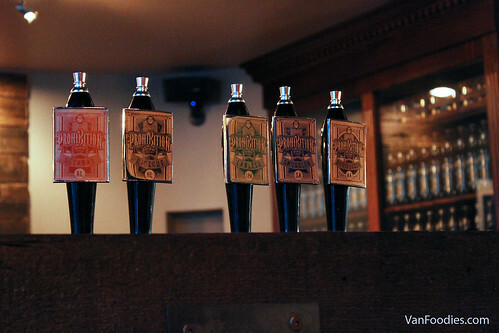 Overall, Prohibition makes a batch of perfectly drinkable beers. I, however, would love to see them swing for the fences and try to make something more special. I feel like they’re targeting the middle of the market with every entry. Moonshine Sour – Full disclosure – I’m the kind of guy who likes to eat the slices of lemon that come with my food/drinks. Why? Because I love sour things. So I’ll give you one guess what I thought of the Moonshine Sour. Very sweet and yes, very sour, with a sneaky high alcohol content. This is a great patio drink. Cider (right, pictured below) [Editor’s note: This cider is brewed by Prohibition as well.] – I’m going to admit right away – my experience with cider is limited. The ones I’ve had in the past were a bit more like apple-flavoured wine than anything. This one surprised me with the amount of carbonation. Picture a carbonated apple juice with alcohol and you’ll have this cider. Spritzer (left, pictured below) [Editor’s note: Spritzer is usually made with white wine, seltzer and club soda.] – Take my first sentence from the Cider comment, but replace limited with nonexistent. It’s like a guy who watches monster truck shows commenting on an episode of Sailor Moon (apologies to the cross Monster Truck/Sailor Moon fans out there – you know who you are). That said, I imagine this as a version of soda water that I would actually drink. 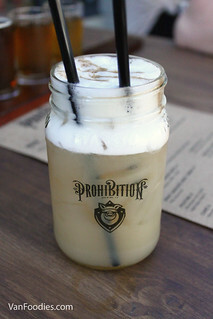 As a beer-led eatery, I thought Prohibition has a very interesting food menu. 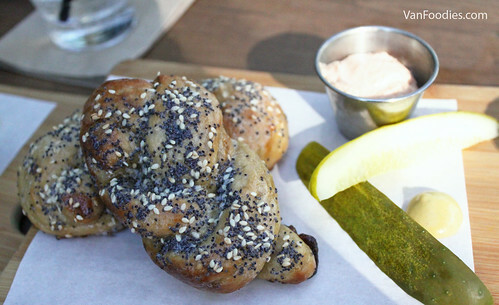 The duck wings and pretzel knots were memorable. 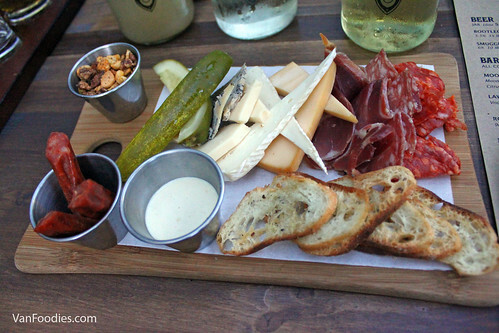 Most menu items are also priced quite reasonable for Yaletown. 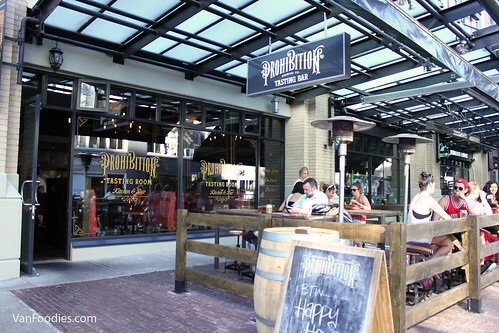 The patio was nice and breezy on a hot summer day, and the drinks menu has plenty refreshing drinks to offer. 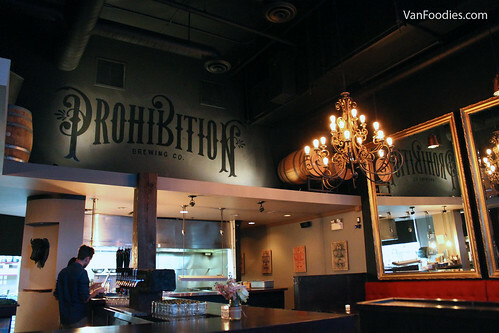 It’s sad to see Cache go, but I’m also happy to welcome Prohibition Tasting Room to the neighbourhood, offering a great option for after-work bites and libations! The pictures of the food looks amazing! I’m so hungry now. Presentation looks thoughtful and I hear the service and people are friendly.